A 60% chance of 100% gain was available in uplisted stocks for prior two years. Stocks that uplisted so far this year have gained 173% in the six months, leading to uplisting. First quarter 2019 uplisted stocks gained 104% on average after uplisting. Much of the gain for this just-completed quarter is from cannabis stocks. One stock in this group stands out for me. I have been studying how to capture potential gains from the uplisting process. My recent article reviewed the stock price performance of stocks that uplisted in 2018. I combined the statistics with 2017 uplisted stocks and found that 60% of the stocks reviewed had average gains exceeding 100% after uplisting before gravity brought these same stocks into, on average, negative territory within a year. In this article, I will review the first quarter 2019 uplisted stocks, focus on one stock that I plan to buy from this group, and provide readers with some uplisting candidates for those wishing to pursue the potential gains prior to uplisting. There were only seven stocks that uplisted to one of the major U.S. exchanges, Nasdaq or NYSE in the just-completed first quarter. The low amount could be due to the government shutdown that we experienced. The stock price results were spectacular, but the fireworks came from just the three cannabis stocks in the group. The cannabis stocks are reminiscent of Tulipmania and the internet bubble. There's money to be made while they are in play, but there's a steep drop from the top at some unknown point. 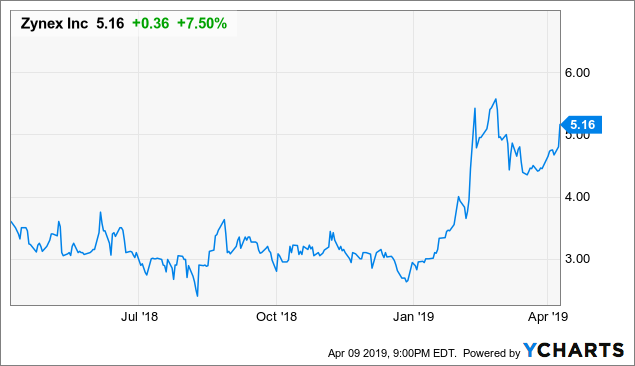 I would discount the potential for gains in other than cannabis stocks from this group, but I am encouraged by gains I found in studying the results of uplisted stocks in the last two years. As I mentioned in my previous article, I don't want to comb through stocks that say they are going to uplist. I'm willing to give up that profit and avoid the risk that they don't uplist. I want to find stocks that have recently uplisted and have the potential to give me a 50% return on their way to a 52-week high within a year due to fundamentals, not momentum. Out of the 2019 first quarter uplisted stocks, Zynex caught my eye. Zynex had a huge runup before its February uplist and has been relatively flat since. This is an electrotherapy pain management device company with a kicker in blood monitoring. The electrotherapy segment is well established and growing. The blood monitoring segment is pending FDA approval as well as European approval. The company has achieved five years of revenue growth as well as 10 straight quarters of profitability. My next article will be more detailed on why I think this stock will return 50% in the next 12 months. Although my interest is on finding gems that have recently uplisted, I would like to provide my readers with as much information as I can so that they can develop their own strategies that may be more suitable to their investment style. I use SA's search engine to find uplist candidates by simply doing a search on "uplist." I recently figured out that another great source is the SEC website, using the EDGAR search tool to find S-1 filings. These filings include IPOs as well as uplisting applications. For those interested in doing their own due diligence, I have prepared a list of stocks that are uplisting candidates, including a couple of the currently hot cannabis stocks. Although I am not pursuing capturing the potential gains in these stocks, I welcome comments from readers that choose to pursue this option. I am disappointed with the slowdown in uplisted stocks so far in 2019. Although we just completed only the first quarter with only seven, there's not a lot of candidates that I could find for the foreseeable future. I do have hopes that the activity will pick up. Please note that it is not mandatory for companies to report intent to uplist at the time of filing an S-1 application with the SEC. In future articles, I will review on a quarterly basis the newly uplisted stocks and continue to compile statistics on the stock price performance of the group as well as provide a list of uplisting candidates. Please be advised that not all companies that say they will uplist actually do and that some stocks are hyped up on their run to uplist and rapidly sell off afterwards. It has also been my finding that most uplisted stocks sell at prices below their uplisting price within a year after uplisting. Disclosure: I/we have no positions in any stocks mentioned, but may initiate a long position in ZYXI over the next 72 hours. I wrote this article myself, and it expresses my own opinions. I am not receiving compensation for it (other than from Seeking Alpha). I have no business relationship with any company whose stock is mentioned in this article.